The task of this project was to design a reconstruction of a room that would be used exclusively for the needs of students and faculty. 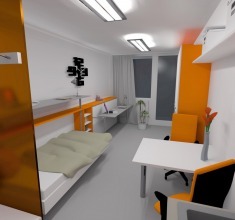 The main idea of our proposal was to create a room that would be for students cozy and welcoming. The basic concept of the solution is based on the current state of the room volume. The room contains two masses that are in opposition to each other - high mass of the utility room in the southwest corner and and mass in the opposite corner containing electrical wiring and aircondotion unit. Both of these masses are playing in our design role. Our main goal was to create a comfortable environment that will serve students for everyday life as well as unique opportunities. Activities of students are ideologically divided into "active" (discussions, meetings, games) and "passive" (watching movies, surfing the Internet, reading). For both of these activities is the need of physical and psychological comfort. In case of physical comfort was important for us to convenience (bean bags, rocking bags, pillows), a full belly (kitchenette with microwave or toaster), without thirst (space for pouring beer or Kofola). Psychic comfort, we have defined the need for silence and privacy (division of space into smaller segments), social interaction (possibility of a settling in groups) and visual comfort (choice of warm materialsaccompanied by soft lighting). 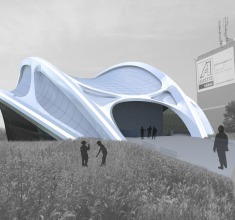 The project roofing sports hall in Prague Lužiny is designed in the spirit of organic architecture. The construction of its full-of-curves-shape concept contrast to existing rectangular panel urban area surrounding Lužiny. The new sports hall brings to an otherwise stereotypical new charge of the estate. Hall and its surroundings is conceived as a new sports and social center of this area. The whole object of sports hall besides the main sports area includes of course the appropriate sports facilities in the form changing rooms, showers and a small fitness. A considerable part of the project occupies a small restaurant. Hall boasts an extremely subtle and lightweight design. Roofing sports hall is solved by two pairs of steel arches with a span of 115 meters. Between these arches is a system of steel cables in a rectangular grid. Rope net is tensioned in the longitudinal and transverse direction. The fields cable networks are then filled with wooden frames with thermal isolation that offer thermal and waterproofing function. The dilation between frames is determined directly in each corner of the wooden frame. The supporting structure of the roof of the hall and the overall thermal envelope of the object is independent of the internal organization and internal structures. The project is based primarily on topography of strongly modeled landscape. Now the microregion is divided by Vltava riverbed to "Right" and "Left" bank. This creates two worlds that are currently connected only by the occasionally functioning ferry, which despite perform the connection is still a barrier. The main feature of the proposal is to link plateaus and deepened river banks using newly created the hiking and cycling trails. These paths have been designed according to historical data obtained from historical maps. Paths are complemented by traditional fruit-tree-alley that divided the extensive field monocultures. Used old fruit-trees varieties and returns to the original scale of the landscape, increase its biodiversity and respond to the traditional form of the Czech countryside and its typical species. In the western part of the micro-region was restored significant way, "Lužická trail" that operate in the territory since prehistoric times. Along the way are marked stops, where can the visitor learn about its long history, its purpose, formation and ultimately extinction. As a place of highest recreational potential was evaluated area around the river. Currently, the shores are connected by only two ferries and one bridge between the Nuclear Research Institute in Rez and the train station. Even the banks are now impassable on several places. In this project we used the opportunity to transfer water supply pipes trought the ceiling above the entrance to the "living cell" in the second half of the solved area. This step allowed us to completely divide the project to two separet rooms -each one with sanitary facilities and small kitchen. Due to the limited space, we devised a variable equipment room: folding dining table, folding bed combined with a table (according to the current position). 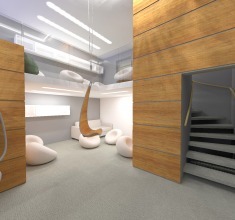 Between the rooms, we propose an acoustic wall thickness of 180 mm. This wall is also proposed as a bulletin board, which students will surely appreciate. Frankfurt bed combined with work table - when the bed is closed, there is available desk to the user. In case of an open bed the worktop is raised up and sits adjacent to the wall without the need of cleaning. The idea of this project is to respect the current characteristics of the plot - its topography and dominant features in the form of both forests. The mass of the building is therefore meant that emerges from the big forest and becomes its extended projection. The other end of the building is then at a small grove of trees on the other side of the parcel. Building in the longitudinal direction follows progress of terrain elevation. The project consists of one main building which is in addition to the garage / workshop located on a single floor. The layout is based on the idea of ​​dividing the building into two units, each of which is used in another manner. There is the part designed for teaching and part for accommodation. The building is trying to fully respond to the orientation of the compass. On the south-eastern facade find classrooms, hall, dining room and bedrooms. On the northern facade you will find a corridor that passes through the object throughout its length. The building is designed as a low-energy. Of course there is, thus achieving a grade A in the classification of the thermal envelope of the building, which provides a superior level of insulation of building - usually well above the recommended values ​​for passive houses. The average heat transfer coefficient of building envelope Uem = 0.119 W / m2K. The building also has a walkable green roof which in the summer helps to keep the subject from overheating. The entire roof area is also used for collecting rainwater. Per year is anticipated volume of 157 cubic meters of water captured. On the cover of the building is located a total of 92 square meters of photovoltaic panels, which should theoretically cover the entire half of the electricity consumption of the building. The goal of this workshop was to create an architectural and urban-design study that would respond to the needs of the town Vrané nad Vltavou in a new fresh ideas form. 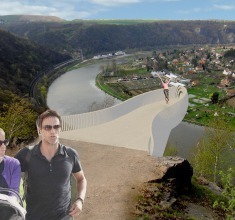 One of the basic elements of this project is linked to the newly constructed bike path from Prague. It was also taken into account to solve the problem of flooding in the lower part of Vrané (below the dam). The next problems are creating the "center" of the town and finding the associated freely accessible spaces and areas for sport and recreation. A very important point of our program was also thinking about the revitalization and conversion area of ​​the old paper mill. 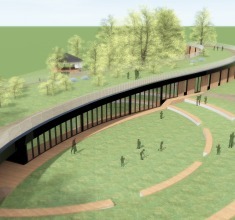 The project dealt with closer links both sides of the river through the newly built footbridge. Designing the observation pier at the highest kicked the left bank. 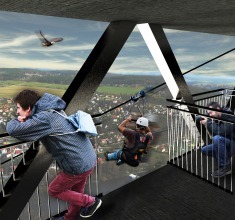 The new designed zip-line would become an adrenalin attraction of regional importance. To satisfy the taste of summer cinema pier or a small pool (this is all based on a public survey among residents of Vrané nad Vltavou), we proposed multi-purpose pier that holds all of these features. 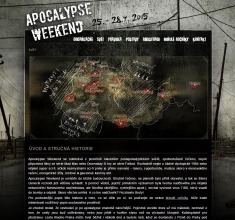 New website post-apocalyptického LARP, which I organize since 2013. It is an all-weekend event for several dozen players. Therefore, it was also necessary for the game to prepare a new, stylized website.